The blog tour for The Siege of Kwennjurat was planned months ago, to begin the day after the book was released, and to run for a week, ending on Hallowe'en. The posts were written weeks ago. The hosts volunteered last week. Today my host was supposed to be JD Savage. He lives in New York. He hasn't posted anything online, as far as I can tell, for three days. I am sincerely hoping that he is just holed up somewhere with his family, safe, snug, and dry. I am blaming his absence in hosting my blog tour on Hurricane Sandy. It's amazing to me how interconnected the world now is, that a person from Arizona can be personally affected even in a small degree by a storm more than two thousand miles away. I'm very lucky, though. The only thing I lost is having someone else make a blog post on my behalf, which is nothing really important in the larger scheme of things. As I post the content here on my blog, my thoughts and prayers are with the people in the eastern half of the North American continent, some of whom are still experiencing Sandy, and others who are now digging out, and those who loved the very few who will never come home. My friend Paul Carroll recently posted on my blog about the technical aspects to creating cover art for novels. He did a very good job, so I'm not going to cover that part of creating cover art. I read an article which shared the different aspects of what writers and marketers feel cover art should be. The writer wants the cover art to include specific details from the novel. They want to tell the story of the entire novel in one single photograph. To the writer, it’s extremely important that the details be exact. If the heroine has red hair and green eyes, the cover model had better match! As I read through this part of the article, I found my head nodding. "Exactly! This is what covers are all about", I thought. Then I got into the second half of the article, explaining what marketers feel about cover art. Apparently, the purpose of cover art is not to tell the story. In fact, if the ratio is "a picture is worth a thousand words", then it would take a hundred pictures to express the content of most fantasy novels. The cover of a book has four purposes: to identify the author, to give the title, to give the genre, and to get the browser in the bookstore to pick the book up and turn it over to read the description on the back. In online bookstores, clicking the link to go to the books page is the equivalent of picking it up and turning it over to read the back. Identifying the author and giving the title are obvious. There have to be words on the cover with the author's name and the book's title. Identifying the genre of the book is not something readers think about. However, both the font chosen for the author name and title, as well as the style of picture, identify the genre on a subconscious level. For example, if a book cover has an old-west wanted poster font, and a picture of a man with his horse, the reader automatically identifies the book as a Western and is either interested or dismissive depending on their opinion of Westerns. Books with starfield backgrounds and planets floating in them are automatically categorized as science fiction, while anything with a dragon, or a large sword is usually a fantasy. A man and woman either caressing or gazing into one another's eyes is obviously a romance, and in many cases the steaminess level of the romance can be determined by how much clothing the woman is or is not wearing on the cover. Finally, the hardest element to include is creating in the reader the desire to pick the book up and turn it over. I’ve found the easiest way to do this is by making the cover pose a question to the reader. The front cover of my novel Deadly Gamble shows a stretch of asphalt with a chalk outline of a body. Obviously, someone is dead. The cover poses the question, "Who died and what were they gambling on?" On the front cover of Fabric of the World is a piece of fabric. The center of the fabric has an image of the world on it. The edges however, are frayed, and some of the strings trail off in different directions. The question here is, "How is the world coming apart, and what can be done to fix it?" 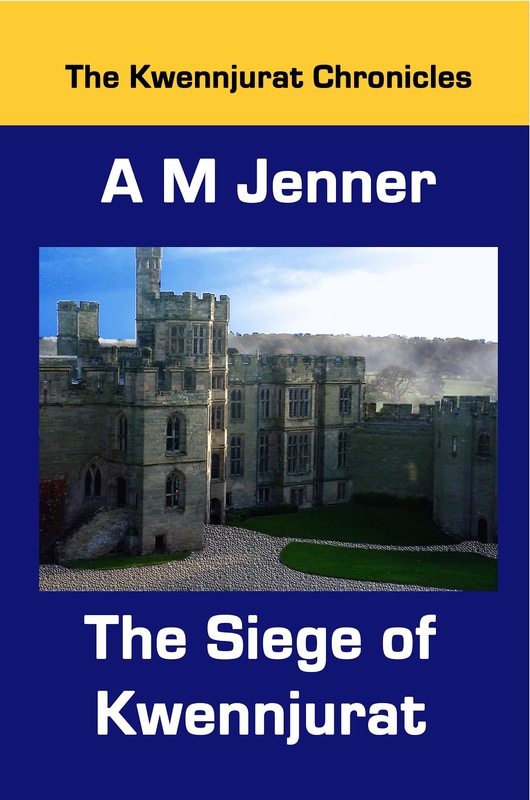 On my newest book, The Siege of Kwennjurat, the cover photo is a castle courtyard, with some kind of mist or dust outside the walls. Is it morning fog coming off the river? Is it dust raised by the besieging army? You'll have to read the book to find out! I never really thought about it before, what makes me pick a book. The title, the cover picture, the author ..... I guess it is a little of everything, but I am sure now I will think about it a little more and if I come up with an answer ... I will let you know! :) Enjoyed the tour! I'm glad you enjoyed the tour. I enjoyed it too, but it will also be very nice to just get back to my normal routine. What is that "normal routine"? Right now I'm supposed to be making the cover for Bits and Bites, which is a collection of short stories. I'm also editing two suspense novels, with working titles of "The Castle Project" and "Words Can Never Hurt Me", and a romantic novella titled "A Gigolo for Christmas" that I hope will be out by Thanksgiving. Plus, I'm plotting a SF novel that involves time travel, and another as-yet undetermined novel. Also, I start writing the SF novel tomorrow morning. Plus my weekly blogs and my daily tweets. Plus real life with my family. Hmmm, it might have been less stressful for me if I had realized how busy my life is. Isn't this also the write a novel in a month, month ? You are as busy as me !!! "Normal" is all relative huh ? Yes, it is NaNoWriMo, and I've got 1,744 words on my novel, Project Kronos, already written. :-) Like the evil magician say, "Busy, busy, busy!" But I love my job, and my life, and wouldn't trade it for anything.